Up to the end of the 17th century, Irish Wolfhounds were used for hunting wolves and deer in Ireland. They were also used for hunting wolves that infested large areas of Europe before the forests were cleared. BRIEF HISTORICAL SUMMARY - We know the continental Celts kept a greyhound probably descended from the greyhound depicted in Egyptian paintings. Like their continental cousins, Irish Celts were interested in breeding large hounds. These large Irish hounds could have smooth or rough coats, but in later times, the rough coat predominated possibly because of the Irish climate. The first written account of these dogs was by a Roman Consul 391 A.D. but they were already established in Ireland in the first century A.D. when Setanta changed his name to Cu-Chulainn (the hound of Culann). Mention is made of the Uisneach (1st century) taking 150 hounds with them in their flight to Scotland. Irish hounds undoubtedly formed the basis of the Scottish Deerhound. Pairs of Irish hounds were prized as gifts by the Royal houses of Europe, Scandinavia and elsewhere from the Middle ages to the 17th century. They were sent to England, Spain, France, Sweden, Denmark, Persia, India and Poland. In the 15th century each county in Ireland was required to keep 24 wolfdogs to protect farmer's flocks from the ravages of wolves. The Cromwellian prohibition (1652) on the export of Wolfhounds helped preserve their number for a time but the gradual disappearance of the wolf and continued demand abroad reduced their numbers almost to the point of extinction by the end of the 17th century. The revival of interest in the breed accompanied the growth of Irish nationalism in the late 19th century. The Irish Wolfhound became a living symbol of Irish culture and of the Celtic past. At this time, one determined enthusiast, Capt. G A Graham, set about obtaining some of the few remaining hounds of the Wolfhound type that could still be found in Ireland, and with the use of Deerhound blood and the occasional outcross of Borzoi and Great Dane, he eventually achieved a type of dog that bred true in every generation. The results were ultimately accepted as a legitimate revival of the breed. 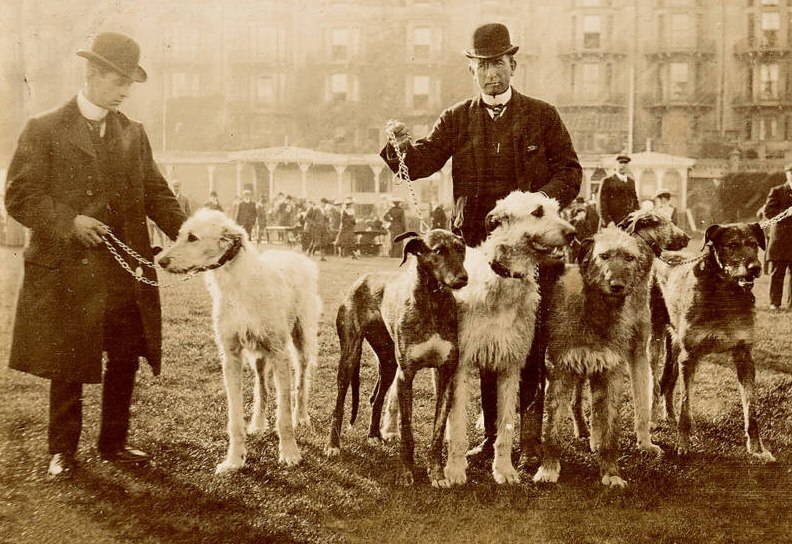 The Irish Kennel Club scheduled a class for Irish Wolfhounds at their show in April 1879, and a club was formed in 1885. The Irish Wolfhound now enjoys once again something of the reputation that it had in the Middle Ages. Wolfhounds are now owned and bred in fairly large numbers outside of Ireland. GENERAL APPEARANCE: The Irish Wolfhound should not be quite so heavy or massive as the Great Dane, but more so than the Deerhound, which in general type he should otherwise resemble. Of great size and commanding appearance, very muscular, strongly though gracefully built, movements easy and active; head and neck carried high; the tail carried with an upward sweep with a slight curve towards the extremity. Great size, including height at shoulder and proportionate length of body, is the desideratum to be aimed at, and it is desired to firmly establish a race that shall average 32 inches (81cm) to 34 inches (86cm) in dogs, showing requisite power, activity, courage and symmetry. TEMPERAMENT: "Lambs at home, lions on the chase". HEAD AND SKULL: Long and level, carried high; the frontal bones of the forehead very slightly raised and very little indentation between the eyes. Skull not too broad. Muzzle long and moderately pointed. MOUTH: Scissor bite ideal, level acceptable. FEET: Moderately large and round, neither turned inward nor outward. Toes, well arched and closed. Nails, very strong and curved. GAIT/MOVEMENT: Movement easy and active. COAT: Hair: Rough and hard on the body, legs and head; especially wiry. Hair over eyes and beard especially wiry. SIZE AND WEIGHT: Desired height: Averaging 81 cm (32 inches) to 86 cm (34 inches) in dogs. Country of Origin - Ireland.